So May is here already.Its the month of my birthday! There are some simple rules to follow! 5.Share the above picture once on your Facebook profile publicly & comment on this post telling me your favorite The Body Shop product. The giveaway starts today 11th May & ends on 31st May 2015! 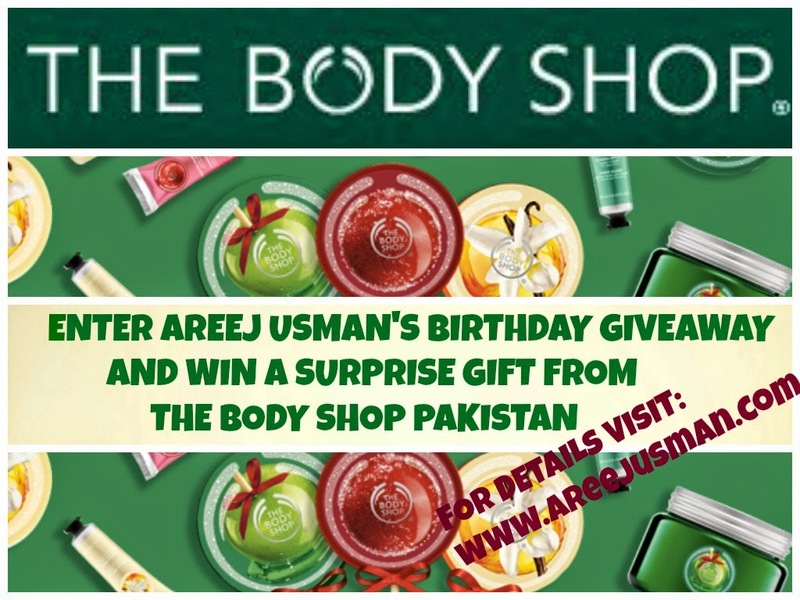 P.SA big Thanks to the lovely people at THE BODY SHOP PAKISTAN for sponsoring my birthday giveaway!I am honoured! Constantine PR,Arora,Faiza’s Salon & Arena Unite for One of a Kind Avengers Premiere! The body shop strawberry body butter is my favourite though the name "The Body Shop" itself is a love for me. My Favourite Body Shop Products they have some amazing body butters. Most of their makeup is good. Another thing I love is their seaweed ionic mask And the hemp hand lotion. When is your birthday Areej? My fav from Body Shop is : The Body Shop Shea Body Butter. My Fav BS Produst is Red Musk Perfume!! My favorite "COCONUT OIL HAIR SHINE"
i love Body Shop's body butter its just awsum. and my favorite body shop products are their body scrub and tea tree range…. Though I have never used any of their product but I'm quite impressed with complete range and would love to win n try.